The Summer is here and, with this lovely weather, we all generally feel that much brighter and enthusiastic about our lives but how great it would be to feel like this all year round? Our eating habits tend to adapt to the Season and so do our socialising activities and aspirations. The diagram shows simplified States of Being and each may occur separately and you may even recognise that you use all of them throughout your day sometimes. Note that none of these States are right or wrong but they give you an insight into what your Being is experiencing, which may help you understand yourself better and more easily decide how to respond. MANAGED STATE – You eat a nutritious varied tasty diet, your needs are met and you manage your life well. Any cravings do not cause you problems with your health; they do however indicate areas of your life which you may still like to explore eg. craving new challenges or more family time. Any on-going health issues may be linked to these cravings too. DEPLETED STATE – If you are feeling depleted, there is too much FOOD for you to process and this is very individual to you. Addressing your diet (physical FOOD) is a start but may not be the whole answer; the other types of FOOD will need to be reviewed and a way forward found. 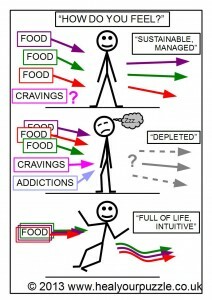 INTUITIVE STATE – As you grow in yourself, your innate ability to manage FOOD from ALL sources improves; you will begin to select FOOD intuitively rather than by a set of rules:- nutritious physical FOOD; supportive family and friends; a fulfilling career and social interests (emotional, mental and spiritual FOOD).